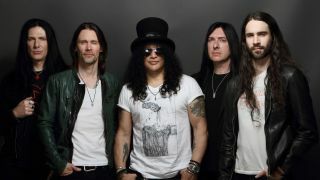 Slash featuring Myles Kennedy & the Conspirators have announced a new round of North American tour dates in support of their 2018 album, Living the Dream. The trek kicks off July 15 in San Francisco and wraps August 13 in Orlando, Florida. Tickets are on sale Friday, February 8 at 10 A.M. local time. For more information or to purchase tickets, head over to SlashOnline.com.